Current and former Indian-American cabinet officials in Virginia Governor Tim Kaine's administration hailed his appointment as chairman of the Democratic Party, and said it augurs well for greater political engagement by Indian-American Democrats at the senior levels of the Democratic National Committee. Kaine will serve as a part-time chairman till next year when he gives up the governor's office to take up the appointment full time. Aneesh Chopra, Secretary, Technology, in the Commonwealth of Virginia government, called Kaine a friend to the community, and said he has "demonstrated a commitment to tap into our expertise to serve in a more formal way. "Specifically, I would suggest there are three areas where I might pay attention to his deeds, not words," Chopra said, listing them as the 50-state strategy, a party of problem solvers and candidate recruitment. "Governor Kaine has publicly endorsed Governor (Howard) Dean's vision of the 50-state strategy not only because he was the beneficiary of that strategy but because it has delivered results. This means more staff positions for a growing number of second generation Indian Americans eager to build professional political careers. Rest assured, we will be judged by the quality of our ideas, not the colour of our skin." Chopra, the first Indian American to serve in the cabinet of the governor of Virginia, spoke of how Kaine had interacted with him in unearthing talent from within the community, including the likes of Vivek Kundra as assistant secretary of commerce, and Manju Ganeriwala as deputy secretary of finance and, later, as state treasurer. Kundra, tapped by the Obama administration as administrator of the Office of Management and Budget, echoed Chopra's words and said Kaine was perhaps the one governor of any US state to have appointed the highest number of Indian Americans to various boards and commissions. "The other thing is that he has been committed to and understands the importance of commerce," he said, recalling how early in his administration, Kaine put together a trade mission to India. "On a personal note, he essentially gave me the opportunity to serve the Commonwealth of Virginia and impact public policy in meaningful ways and created a foundation that allowed me to serve in the DC government." Co-chair of the India American Leadership Council in the DNC Shekar Narasimhan said Kaine was "a known quantity -- he's fully supportive of our interests and also of US-India relations." From the larger political point of view, Narasimhan pointed out that Virginia had gone against type and voted for Obama in the 2008 presidential election. "Kaine knows what it takes to turn Red to Blue, and he's committed to the successful 50-state strategy which Governor Howard Dean (the outgoing DNC chairman) was the primary proponent of." Kaine's appointment is a signal that Obama finds the DNC relevant, Narasimhan said. "He would not have picked a sitting governor who is a good friend of his to run it unless he wanted it to be relevant." Narasimhan said the key was to "make every effort to ensure that the Indian American Council within the DNC will continue. We will also maintain this broader Asian American coalition -- it was so successful in getting us all the attention we wanted during the campaign. So both have to continue -- we need our identity but we also want to be part of a larger umbrella so that we have the clout that we think we deserve." He said he was interested in working with Kaine "to bring in some younger leadership into these groups", and said he would be inclined to tell the governor to "please continue the Council, but also make sure that we are part of a larger Asian American coalition so that we can continue to work together for the issues that we share, and mobilize together." "We did it very successfully in the presidential campaign, and so once again, we need to bring in all the parts of the community into the fold again -- particularly those older folk in the community who did not engage the last time, and make sure that they all become active and participatory Democrats." 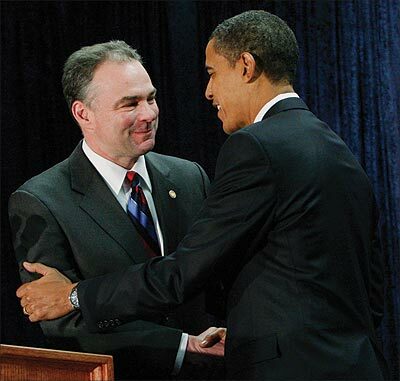 Image: Virginia Governor Tim Kaine with US President Barack Obama.